We have already told you about All You Can Eat restaurants in West Jakarta in this article. Now, we will talk about cozy and delicious Japanese restaurants in West Jakarta. If you love sushi, ramen, and other Japanese food, you can visit these places at the weekend with your family or friends. Address: Central Park Mall, 1st floor, Jl. Letjen S. Parman, West Jakarta. Surely, there are so many people have already know about this sushi restaurant chains. You can find Sushi Tei in almost every shopping malls you visited. You can easily walk from Taman Anggrek Residences to nearest Sushi Tei restaurant at Central Park Mall. The outlet in Central Park Mall is spacious and cozy with an open kitchen concept. 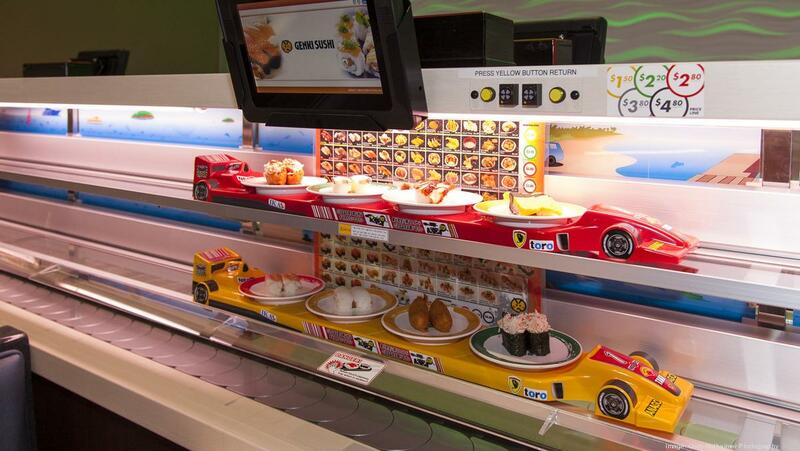 People usually choose to sit at the sushi bar area so they can easily pick sushi from the conveyor belt. Their recommended menu is Tuna Salad Crispy Mentai, sushi with fresh tuna and creamy mayo sauce. Maybe you have already visited Sushi Tei many times, but still have no idea that they serve ice cream in the menu? Pino Ice Cream is packaged inside a transparent plastic with strawberry and coffee flavor. The texture is like mochi, chewy with the ice cream inside it. The operation hours is following Central Park Mall’s operation hours, every day from 10AM until 10PM. Address: Central Park Mall, UG floor, Jl. Letjen S. Parman, West Jakarta. Originated from Japan, Genki Sushi is one of the key player sushi restaurant chains available worldwide. In Jakarta, you can find one of their outlets in Central Park Mall inside SOGO Department Store area. The authentic service from Genki Sushi is that they serve order using a unique shinkansen conveyor belt. Their ordering system is also different from the other restaurants. Customers use a tablet for order and after the order is ready, it will be delivered automatically into the table using shinkansen sushi train. Sounds so fun, right? Love salmon? You must order Salmon Triple Flavor! In one plate, you will get fresh salmon, seared or aburi salmon with mayo + black pepper and seared or aburi salmon with mayo mentaiko. Same as Sushi Tei, the operation hours of Genki Sushi also following Central Park Mall’s operation hours. It’s every day from 10AM until 10PM. Address: Neo SOHO Mall, UG floor, Jl. Letjen S. Parman, West Jakarta. Same as Genki Sushi, Sushi Hiro has an authentic way to serve the sushi. If Genki Sushi use a unique shinkansen conveyor belt, Sushi Hiro is using mini wooden stairs making the sushi very instagrammable. No wonder they always have a long queue every day in front of the restaurant. Not just instagrammable, the sushi is also delicious that the customers always have a reason to come back. Sushi Hiro is a modern Japanese sushi restaurant with a wide variety of dishes and nice Japanese ambiance inside the restaurant. 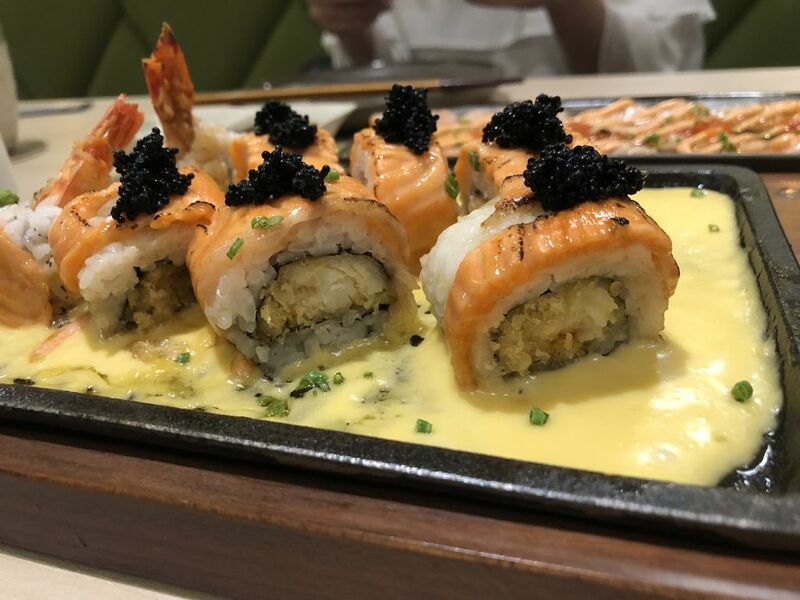 One of the signature menu of Sushi Hiro is unagi sushi roll topped, with aburi salmon and mayo tobikko sauce. Beside the sushi, you must try Ultimate Truffle Tori Dry Ramen, a unique dry ramen with egg, chicken, onion, and garlic flakes. The operation hours of Sushi Hiro is following Neo SOHO Mall’s operation hours. It’s every day from 10AM until 10PM. Address: Jl. Taman Aries No.3B, North Meruya, West Jakarta. Do you know Yellowfin, a cozy Japanese restaurant in Senopati area? Yellowfin and Sushi Oji are in the same group management. You can say that Yellowfin is a high-class restaurant when Sushi Oji is targeting young people with more affordable price than Yellowfin. Sushi Oji has a nice ambiance Japanese concept with spacious and clean area, very perfect Japanese restaurants in West Jakarta for your weekend culinary hangout. You must try Salmon Aburi, the favorite menu if you visit this restaurant. Not just sushi, you also can try ramen, sake, and many more. This sushi restaurant is open every day and the operation hour is from 10AM until 12PM. Address: Jl. Ratu Kemuning Raya Blok A2 No. 8A, Green Ville, West Jakarta. This ramen house is located at Green Ville, a culinary center in West Jakarta. This is their first branch in Indonesia, they already owned 8 other branches spread around Japan. As a ramen house, Tsurukamedou is using Japanese style for the interior. When you visit this restaurant, it feels like a ramen bar in Japan. There are two types of ramen for your choice, Tonkotsu Ramen with pork for the base dressing or Tori Ramen with chicken for the base dressing. Usually, ramen only uses boiled pork for the topping. In Tsurukamedou, you can ask them to grill the pork. If you love spicy food, you can order Tonkotsu Shisen Ramen, the favorite menu for a spicy lover. Not really into spicy food? Tonkotsu Ramen is a nice choice for you, then! Tsurukamedou operation hour is 11AM until 10PM and its open every day. Address: Kedoya Center, Jl. RayaPerjuangan I, Kebon Jeruk, West Jakarta. Looking for halal Japanese restaurants in West Jakarta? You can come and visit Pare’gu at their operation hours, 11.30AM until 10PM from Monday to Sunday. At Pare’gu, you can find halal grilled food with all you can eat concept without time limit. Their favorite menu is grilled ribs, beef yakiniku, and shabu-shabu. Pare’gu also have free wifi, parking area, smoking area, and VIP room. If you’re interested with Pare’gu, make sure to book a reservation first because this restaurant is always crowded. There are so many Japanese restaurants in West Jakarta to choose. Check your schedule and call your family or friends for weekend hangout with them!